Bad Bergzabern, in 1944 a town of 4,883 inhabitants in Rhineland-Palatinate, Germany, foot of the Haardt Mountains (coordinates: 49° 6′ 11″ N, 7° 59′ 56″ E), where Hans Denck, having been banished from Strasbourg, appeared publicly in January 1527 and won considerable influence over the population, especially on Nikolaus Thomae called Sigelspach, the pastor of the church there, who repeatedly expressed Denck's views in letters to Oecolampadius, the Basel reformer, and to Capito and Bucer, the Strasbourg reformers. It was not possible to establish an Anabaptist congregation there; a small circle of Anabaptist-minded men gathered about him for the time being, of whom Sigelspach wrote in 1529 that they were "pious and good men." After the Thirty Years’ War a number of Swiss Mennonites settled on neighboring estates; they belonged to the Deutschhof-Geisberg congregation. Hege, Christian and Christian Neff. Mennonitisches Lexikon, 4 vols. Frankfurt & Weierhof: Hege; Karlsruhe: Schneider, 1913-1967: v. I, 166. Hege, Christian. Die Täufer in der Kurpfalz : ein Beitrag zur badisch-pfälzischen Reformationsgeschichte. Frankfurt am Main : H. Minjon, 1908: 14. Hege, Christian. "Bad Bergzabern (Rheinland-Pfalz, Germany)." Global Anabaptist Mennonite Encyclopedia Online. 1953. Web. 22 Apr 2019. http://gameo.org/index.php?title=Bad_Bergzabern_(Rheinland-Pfalz,_Germany)&oldid=144764. Hege, Christian. (1953). Bad Bergzabern (Rheinland-Pfalz, Germany). Global Anabaptist Mennonite Encyclopedia Online. 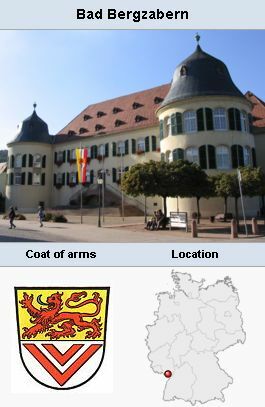 Retrieved 22 April 2019, from http://gameo.org/index.php?title=Bad_Bergzabern_(Rheinland-Pfalz,_Germany)&oldid=144764. Adapted by permission of Herald Press, Harrisonburg, Virginia, from Mennonite Encyclopedia, Vol. 1, p. 283. All rights reserved.